Wedding season never ends in sub-continent such as Pakistan, India, Middle East and Bangladesh. and This is the hottest season of a wedding and everyone is preparing for their weddings. Shopping, a Hiring photographer, booking hall or banquet. Apart from them the most and the very important thing is to hire the best makeup artist for bridal makeup, searching lots of makeup artists? beauty parlors? but no use. I know it’s the hell of a duty to find your best bridal makeup artist and tell them what you want. There are lots of makeup artist in Pakistan such as Kashif Aslam, Sabz and Wajid Khan. you can find a complete list of the best makeup artist for your wedding makeup. And for the best bridal makeup idea, we have compiled a list of 5 new bridal makeup 2016 videos, These videos are taken from YouTube from top makeup channels of Pakistan and India. So let’s have a look below. As you know Indian Bridal Makeup is always a beautiful makeup, their traditional bridal makeup is a must-have makeup these days, in this video you will watch amazing bridal and festive bridal makeup, this video contain a tutorial of smokey eye makeup as well which is very famous these days, so watch the video and get an idea how you can have a stunning Indian bridal makeup for your wedding day. This is an amazing Bold Asian Bridal Makeup, in this makeup, the artist has used blue glitter and decorate the eyes with the smokey look which will give you a stunning bold look. This bridal makeup is perfect for tall and fair skin girls who wants to look bold on their wedding day. In fact, you can use this makeup style on any part or your friend’s wedding if you want to have a bold Asian look. In this video you will see how you can have an amazing traditional Asian bridal makeup for your wedding day, the artist also did a hairstyle in this video to have a perfect bold look with this makeup type. This traditional bridal makeup is perfect for Pakistani, Indian and Bangladeshi girls, or even if you are living in Abroad and you are a desi skin type you can have this stunning and beautiful makeup on your wedding day. This is a detailed tutorial for those who wants to have smokey eye bridal makeup for the festive and party look. The artist in this tutorial done an amazing smokey eye bridal makeup for Asia girls step by step, even if you are a beginner makeup artist and just like to do makeups then you can learn an amazing bridal makeup by watching this video, So try to learn all the given step in the video and apply it and see the results. In this video artist done an amazing makeup of real bride, If you are looking for a bridal makeup with red glitter and smokey eye then watch this video and get an idea to how you can have this beautiful smokey eye makeup with red glitter. This bridal makeup is perfect for Asian brides who are living in subcontinent especially in Pakistan, India, and Bangladesh. You can have this makeup for any other festival or parties as well. 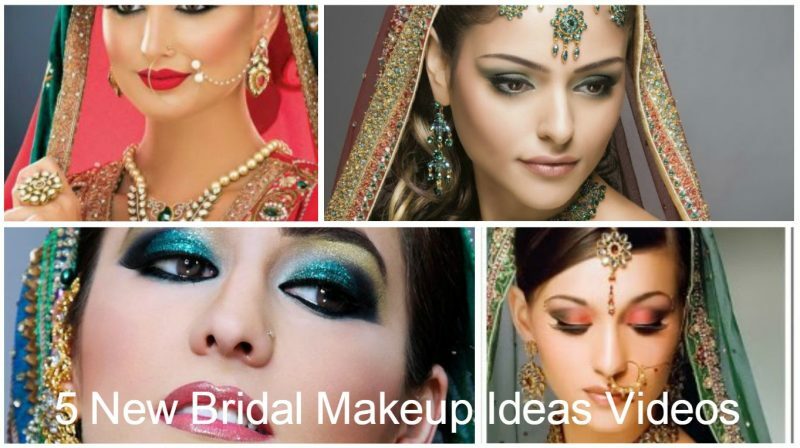 So these are the 5 new bridal makeup ideas for the current season of a wedding, if you are going to be a bride of this season then try one of this makeup and get an amazing photo shoot to portrait your memorial day beautiful forever. If you liked one of these videos above then do not forget to like and share it with your friends and also don’t forget to comment us in the box below.